Home » World » USA & Canada » Plane Crashes into Shopping Mall! Plane Crashes into Shopping Mall! Looks like a doomsday nightmare. But nothing to worry it was just a small experimental plane that burst into flames on crashing and injured 5 people. There is still no official information about the pilot and the passengers. 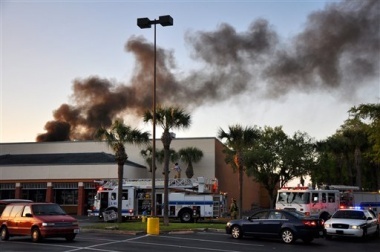 A small experimental plane sputtered and crashed in flames into a supermarket at a Florida shopping center Monday evening, injuring five people and sending frightened shoppers running from the store, authorities said. Several people in the Northgate Shopping Center in Deland dialed 911 around 7:20 p.m. to report the the twin-engine aircraft had plunged into the complex, the Volusia County Sheriff’s Office said. Callers said the plane showed signs of trouble moments before it plunged and hit the roof of a supermarket of the Florida-based Publix chain. “A twin-engine experiment aircraft has crashed into the roof of the Publix supermarket,” Deland Police Sgt. Chris Estes told The Associated Press by telephone. “Publix is the only structure to suffer any damage.” But he said all the businesses in the complex were closed to make way for emergency crews. He said the plane had taken off from a nearby municipal airport in Deland, a Florida city about 20 miles west of Daytona Beach. The police spokesman added that three people had suffered severe burns and two others had moderate burns but he didn’t elaborate on how many injuries were suffered on the ground or aboard the aircraft. However, the Volusia County Sheriff’s Office said a pilot and a passenger from the plane were airlifted to Orlando Regional Medical Center. Spokesman Gerardo Morales later confirmed to AP that two people had been airlifted there, but he declined to identify them or discuss their injuries. Broadcast station WFTV reported on its website later that Publix employees who declined identification were nearby when the plane crashed through the roof. The station reported that workers saw the pilot and a passenger climb from the plane with their clothing on fire. The report added that a manager in the supermarket’s meat department was able to put out the fire in their clothes and get them from the store. The report also said both of the plane’s occupants were severely burned and three other adult shoppers in the store were taken to a Deland hospital where one was treated and released. But it said none of the shoppers had life-threatening injuries, according to an unnamed hospital official. A dark column of smoke wafted from the supermarket rooftop afterward. About 20 fire trucks at one point crowded about the complex and firefighters atop a truck’s extension ladder poured streams of water on the flames. Kathleen Bergen, a spokeswoman for the Federal Aviation Administration, told The Associated Press in an email that the FAA did not provide air traffic services for the flight and had no information on the plane, its flight or those aboard. A call by AP to Publix at its Lakeland, Fla., headquarters was not answered Wednesday evening. Its website says it has 748 store locations in Florida and dozens more in four other Southern states, the largest employe-owned supermarket chain in the U.S.